Garlic ginger paste is a great way to simplify Indian cooking. 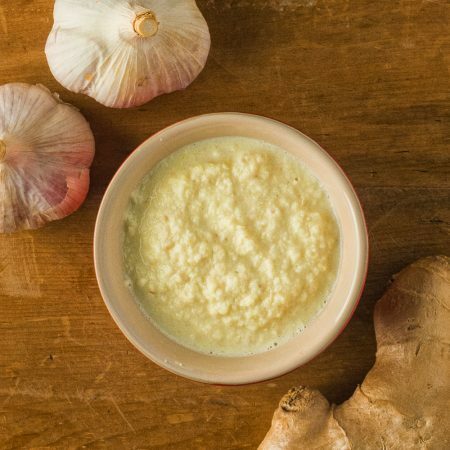 Recipes would have you puree garlic and ginger every time you make dinner. That’s a blender to clean. Pretty big overhead. You can buy garlic ginger paste. I used to. Then I tried making it fresh. I threw out my jar of store-bought and have never used pre-fab again. It’s easy and it keeps for weeks or even a couple months in a container in the fridge. You can scale this recipe up or down as needed. Home made garlic ginger paste is way better than store bought. It's easy to make and it keeps well in the fridge. You can also freeze it in ice cube trays and pull out a cube when you need it. enough water to get it to all puree. Combine garlic, ginger, oil and salt in a blender. Puree, adding water as needed to get the mixture to blend thoroughly. Store in the fridge. Discard when the flavours fade. In indian, sides and stuff. Bookmark the permalink. I always just grind ginger and garlic separately for my Indian dishes but so many recipes call for just ‘ginger garlic paste’. Good to know how I can make it! Thanks for sharing.